Born in 1917, Helmut Matheis studied at the Munich Academy under F. H. Ehmcke. His typefaces include Primadonna, Charme, Slogan, Matheis-Mobil, Contact, Compliment, Presto, Prestige, Windsor (all for Ludwig & Mayer), Verona (Genzsch & Heyse) and Judo (Neufville Digital). The first one, Primadonna, was cast in 1956. The latest one, Judo, was issued in 2013. 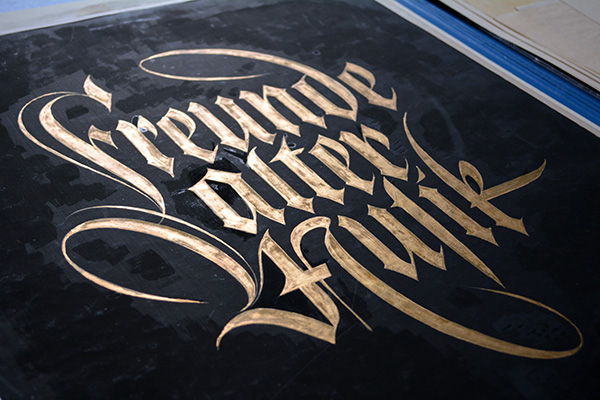 Matheis was also active as calligrapher, lettering artist, and designer of marks and logos. You can read more about him and see a selection of his works in my article for Fust & Friends. To celebrate his 100th birthday, one of his typefaces, Presto, is made available in digital form for the first time ever. Stunning work. Blessings to H. M.! And thanks a lot for pointing at this. I have been thinking about artistic longevity and immortality for years. I try to imagine what it would be to live and create for hundreds of years. How far would Leonardo go if he got to be 400? Goethe? And if the great enemies of mankind would live to be a thousand so they could serve a full sentence for their crimes and experience the full and utter extent of the evil they unleashed into the world? Then again, I think that each and every one of us has already lived over a hundred years. The reason being, that what now takes 5 years took 20 in the previous century and a hundred before that. We now can create our art much faster and far more accurate, and it is much easier to get information and feedback, much easier to grow. My grandfather had to change his place of living just so he could study in the capital, and live there. Why? Because it's where the National Library is. How much further will it go? I feel like mine was the first generation to come head to head with the angels and monsters of the computer age. The Wall fell in '89, and five years later we got the Web. I first experienced it in crappy computer/gaming clubs (what you call "internet cafes", but here it's more like a mucky pub) around '00. Those are gone now. We were the first to see flame wars, we had no clue how to react and not be trolls ourselves. And now many of my friends have children that can swipe and select on a screen before they can read. How much further? They will be the ones to find school unnecessary and learn how to deal with the monsters of the internet. How much further? They will perhaps live in a world where eye techlenses make computer screens obsolete. How much further? were sometimes a nasty novelty.